I enjoy Facebook groups as it allows you the opportunity to get to know crafters and participate in fun challenges. I was recently in a challenge called Mischievous Crafter where each person made a home made gift valued at $10.00. we posted our creations and played the Naughty Santa game where you can steal the other persons gift. It was so much fun. I made a 12 piece box set of cards, 2 of each design. Here are the cards I made and sent to the crafter who selected them. 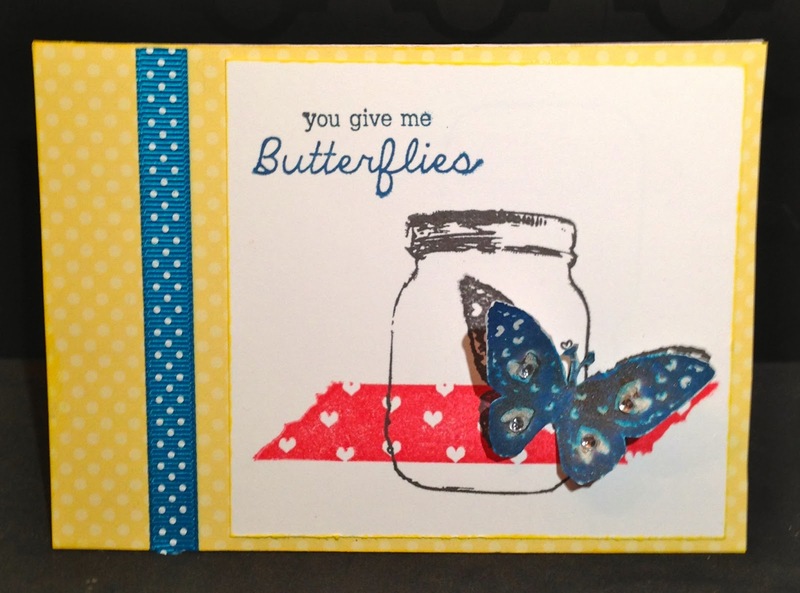 This card was made using CTMH Dotty (retired special) paper. The stamp is from Unity Stamp company. I used CTMH Pacifica, Holiday Red (retired) and black ink. The ribbon has adhesive on the back which makes it easy to adhere. I believe I got a variety pack at Michael's last year. I hand cut out the butterfly and used a glue dot behind it and added some bitty sparkles to the wings. This card was created using Sarita paper pack and Gypsy card base. 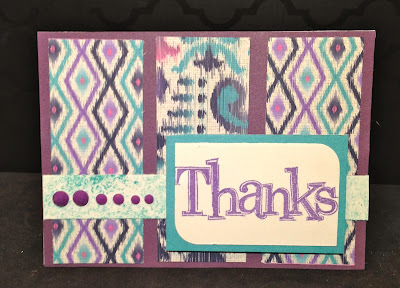 The stamp is CTMH as well as the purple embellishments. I used Lagoon and Gypsy ink. This is my favorite card. The stamp set used for the plant and butterflies was from Michaels but I don't know the name of the company who made it since I threw the package away. I used Chocolate and Juniper ink. 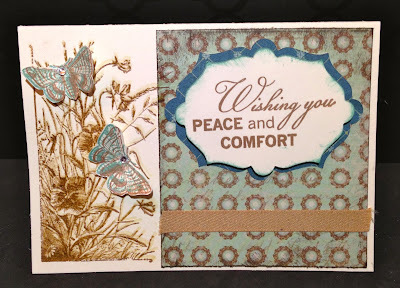 I heat embossed the plants after I stamped it which made it very pretty. I used the Artiste cart to cut out the shape for the sentiment stamp. The paper is Avonlea (retired BUT CURRENTLY IN WHILE SUPPLIES LAST FOR $2.00!!!!!). The stamp set is Words of Comfort. I made a similar card before using The Happy Couple stamp set. I used the Artiste cart to cut the flowers. The based is For Always paper. I used Whisper ink for the cake and bitty sparkles in the center of the gray flower. So cute!! 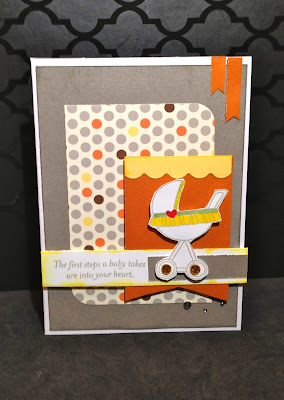 I used Babycakes paper and the B is for Baby stamp set. The design for the card came from the Make It From the Heart Vol. 2 book. You can't go wrong with these books that make it so easy to use different design concepts for scrapbook layouts and cards and it is only $7.95. Great deal!! You may have noticed you have seen this card design before. 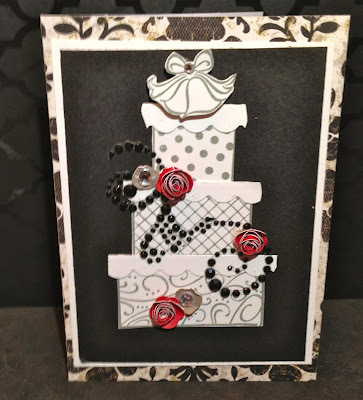 I used this same concept using scraps for a Christmas card. 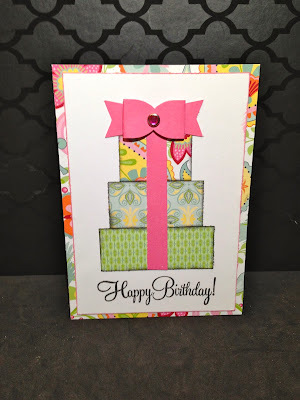 This time I made it a birthday card using Chantilly paper. 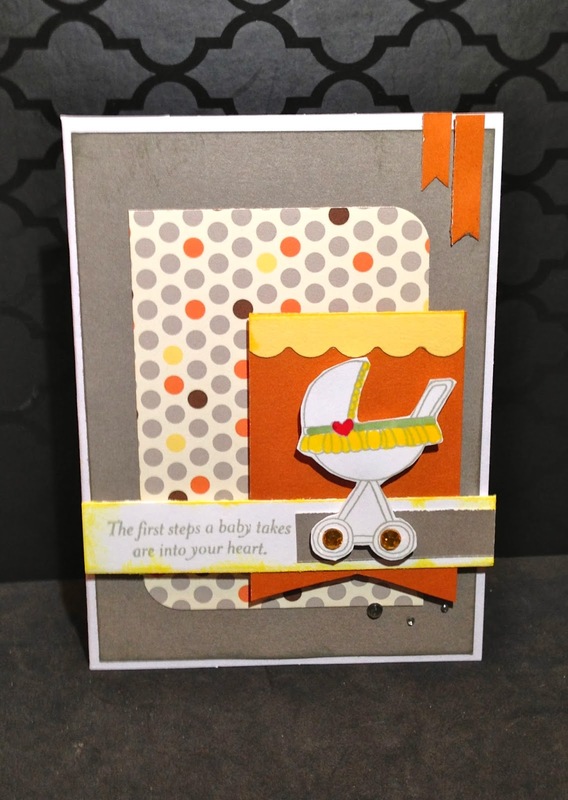 The stamp set is Card Chatter - Birthday. The bow was cut using the Artiste cart. I hope you enjoy this showing of cards. Thank you for stopping by and Happy Crafting! !